2. To make dough, cream butter, sugar, and zest with electric mixer. Add egg and vanilla paste and extract. Mix until incorporated. Add flour/tea mixture. Mix just until well combined. Wrap dough in plastic and chill in freezer for 15-20 minutes. 4. Lightly dust counter with flour, roll out dough to 1/8th inch. 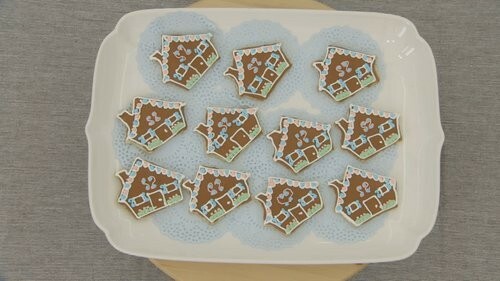 Cut out houses with cutter. Place on parchment lined baking sheet. Bake for 9-12 minutes or until just slightly golden at edges. Let cool completely. 5. In a small bowl, combine tangerine-clove glaze ingredients with whisk. Pipe with small round tip around border of all houses. Thin out icing a bit with a little more tangerine juice or water. Flood inside border. Let set for 5-10 minutes until dry. 6. Mix all Royal icing ingredients (except colors) in mixer for 7-10 minutes on low until stiff peaks form. Color batches for decorations- light blue, light green, coral pink, and white. Put each color in separate piping bags with small round writing tips. Pipe intricate decorations on all of the houses. Let dry completely. 1. Preheat oven to 350 degrees. In a food processor, pulse together flour, powdered sugar, and salt. Add butter and cream cheese, pulsing until crumbly dough forms. 2. Remove to clean work surface, knead just until dough comes together. Divide in half, form into discs, wrap and freeze for 15 minutes. 3. Meanwhile, melt chocolate chips and jam in small microwave safe bowl for 30 seconds on high. Stir together and let cool. 4. In a separate small bowl, mix together brown sugar and cinnamon. 5. Liberally dust work surface and rolling pin with powdered sugar (about 2 tablespoons per dough disc). Roll out discs to 9 inch circles. Using a small offset spatula, spread chocolate mixtures evenly across top of dough. Sprinkle evenly with brown sugar mixture. Using a pizza cutter, cut each into quarters, then each quarter into thirds, to make 12 long triangles. Roll up from outside in, placing on parchment-lined baking sheet, tip of triangle underneath. Chill in freezer for 10-15 minutes, if possible. 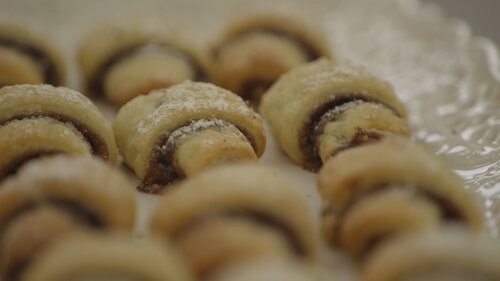 Make egg wash with egg and water, brush on top of rugelach, sprinkle with sparkling sugar. Bake for 19-21 minutes until golden brown and flaky. Let cool. Dust lightly with powdered sugar. Remove any crispy bits of filling that have overflowed and hardened. 6. If desired, melt additional chocolate chips in microwave, place in piping bag or ziplock bag, snip tiny edge and drizzle chocolate on the diagonal across cookies. Let set on wire racks. Serve.